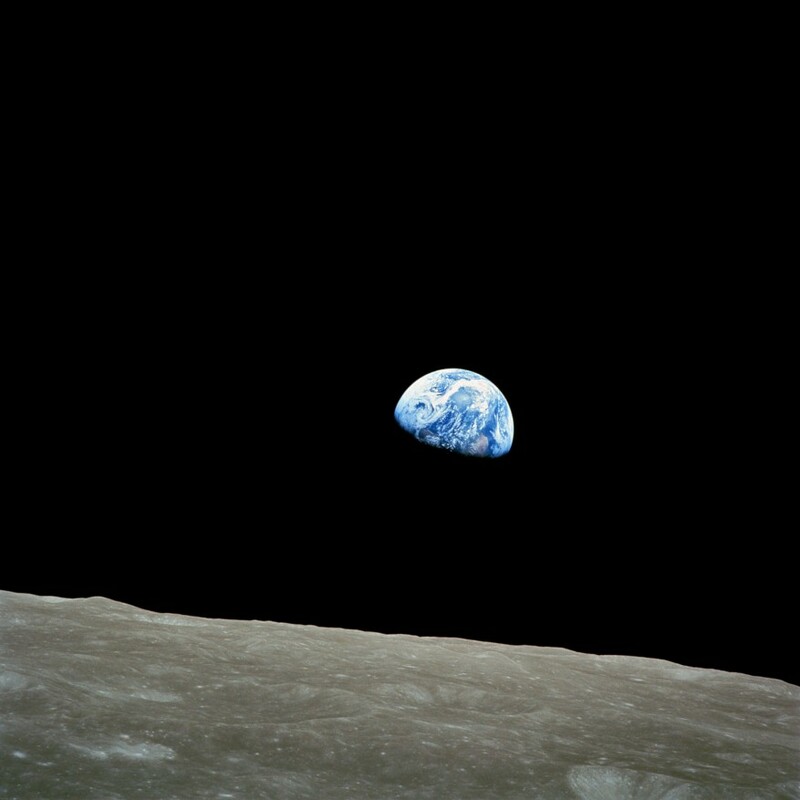 "Earthrise," by Astronaut William Anders, Christmas Day, 1968 from the front window of Apollo VIII's lunar capsule. Immanuel Kant, the Surly Bartender’s alter Freund, claims “. . . out of the crooked timber of humanity, no straight thing was ever made,” and I know he’s right, but to believe only that is to be a hopeless cur, and so I put equal faith in another wizened, romantic comrade, Mr. R. Browning, who observed “A man’s reach should exceed his grasp, or what’s a heaven for?” Ahhhhh, yes. I know he’s got it dialed in, too! Grim sensibility on one wing, aspiration and exultation on the other. Without the moon and mezcal to guide me, I’d certainly fly in circles between my two masters’ visions — one moment soaring then next sinking at their damn near holy realizations. We are, as a species, forever caught between the veil of night and the luminance of stars, a violent and beautiful place that, if I can crib a line from Good Brother Hawking, is the event horizon of human existence. It is in that place that civilizations clash and religions viciously contend. At the crook-timbered threshold of this realm, death is rained down upon us. It is where violent men with machine guns walk through the front door, scream the glory of their God, then pull the trigger. Immanuel, I get it; people are seriously screwed up and they get worse when you jam them together into tight spaces. It’s an ugly, ugly situation. And yet my reach still exceeds my grasp. I still hope. It is not a blind hope, either — though I do suspect it will take several centuries for human beans to see the fullness of that better day. Thus, with reason, I call it my Four-Hundred-Year Hope. This period of profound, beneficial change has only recently begun and, I believe, there is good fortune to have been on the planet when it all began. It is my hope to convince you of that here. I truly believe that people will talk about our time someday with a touch of reverence, which is difficult to get one’s head around, given all the holy hell that is making the news these trying days. The changes that are occurring, and I argue will continue to occur, are deep in our species’ metaphorical DNA. The changes, only just begun, are difficult to perceive just yet. To detect them, you have to listen closely and with trained ears, but they are there, as surely as every zoologist was once a zygote. I also must say, being one of the first folks on the planet to recognize what is coming down the road is energizing, and it does allow for some profound calm in trying times, so if you have a few minutes, I’d like to explain. This change I speak of started at a knowable moment, an actual split second on Christmas Eve, 1968. Because of that seemingly insignificant flick of history, I hang my hat on the hope that by the late 24th century things will really be looking up, at least in the Clash-of-Civilizations way that continues to consume ridiculous amounts of resources and end far too many lives. I chose the late 24th century for the bon temps because, knowing something about the way that science always leads belief, that era places us four centuries removed from when the inhabitants of our planet first saw themselves in one, big family picture — a shiny blue drop of earth, wind and water inside a black field so vast that we might be lost forever if an observer were to become distracted by a comet or a nova or a solar flare. The photo was taken by Astronaut William Anders during the Apollo 8 mission to orbit the moon. It was not scheduled; the telemetry just worked out as Mission Commander Frank Borman executed a roll to photograph sites that might be usable for Apollo 11 as a landing field. Commander Borman looked, then joked, “Hey, don’t take that, it’s not scheduled. Then . . . Click. Now, you might find it silly that I believe a change so large as to restructure the very order of the world might come from something as simple as a photograph, but changes as profound have happened from such seemingly insignificant moments before. Political structures, belief systems and religious views — under normal conditions — change slowly, like the geology of a river valley, but they are always in motion. For decades, if not centuries, they persist in patterns. Streams do become rivers. Rivers do eat away at mountains. And sometimes, the dam breaks and floods the valley below, altering everything that came before that moment. If you doubt that, then where are the temples of Aphrodite today? Where could a young, aspiring Persian go to find a bull to hurdle in honor of Mithra? If you’re still with me, then let’s look back to consider a time when such a radical transformation began before. Most folks know the story of Isaac Newton getting bonked on the head with an apple. Most of those folks likely think that the story is apocryphal (it’s not), but that is neither here nor there. Kids learn about Newton in grade school, hear of him again in middle school and run over the ground one more time in high school, this time in both history and physics. Yet, the importance of Newton’s realization is often lost somewhere in the hallway between the offices of the History and the Science departments. I remember being a kid and hearing the story of Newton, the apple, the discovery of gravity and thinking, “Wow. That’s kinda stupid.” It didn’t make any sense to me that Newton discovered anything. It’s not like people didn’t know that apples fell to the ground before he came around. I thought all he did was give it the name gravity. To me, the whole thing seemed like a scam. Newton did away with all of that by making a cognitive leap from an empirical observation. He sat beneath the apple tree; an apple fell from its branch and struck him on the head; he had an honest-to-God epiphany, and it was this: There is a force that all objects exert upon all other objects in the universe. The larger the masses of the objects, and the closer they are to one another, the greater that force. The apple is not pulled to the earth by angels, it is pulled to the earth by a force, describable in a mathematical formula, that is correct everywhere at all times, and acts on everything from apples to astronomical bodies and from serfs to sovereigns, alike. He then set to doing the math. His epiphany held true and he could soon could explain it all with numbers and a simple formula. Apples appeared to fall to the earth, but actually both the Earth and the apple were falling toward one another and Newton could describe the angles and the acceleration. He could also explain the revolution of the moon around the earth using the same formula. No one before him had ever conceived the moon as “falling” towards the earth, but Newton saw another dimension of the problem and reasoned that just as the earth and the apple draw one another to a common center of mass, so does gravity pull the earth and the moon towards a common center of mass. The moon never does get closer to the earth because it has another force working at a right angle to the gravitational force — its orbital velocity. The moon, Newton reasoned, was falling around the Earth. As the Moon is falling around the Earth, so is the Earth falling around the Sun. He then reasoned that if he could shoot the apple fast enough at a parallel to the surface of the earth, that apple would strike him in the back of the head in the time that it took the apple to fall from the tree and bonk him on the noggin. These concepts were very dislocating, but undeniably true observations. To Isaac Newton, a deeply religious man, it felt as if he had stolen a page from God’s rule book for all creation. He had reasoned his way to understanding a small bit of God’s mind. Newton, in his time, stole three more pages from God’s Book of Immutable Rules. One page read Force = Mass x Acceleration. Another noted that every action in the universe has an equal and opposite reaction. A third page expressed that an object in motion will stay in motion and an object at rest will stay at rest unless acted upon by another force. Rene Descartes, a few decades before Newton picked up pen and protractor, had suggested that God was like unto a great clockmaker who built the universe at the beginning of time and then stepped away to let it run by perfectly attuned rules, and here stood Isaac Newton holding four of those rules in his profound and beautiful hand. What a time to be alive, despite all the holy wars, poverty and man’s grotesque inhumanity toward man. Not too different than today, really. These empirical observations, explained mathematically and borne out by repeatable experimentation, carved channels into the granite of ages-old Catholicism and the newer, but equally zealous, Protestant faiths. Europe’s religious leaders, and ultimately the political leaders in the centuries to follow, might have wished that they could have prevented Newton from his epiphanies, but once released, they could not be put back into the genie’s bottle. Ready or not, the world was going to have to change in deference to these new realities. I can hear you thinking, “So, Newton sent some angels to the unemployment line. So what?” You’re not wrong for the skepticism. The church had been beating back the heretical ideas of smartypants like this odd British scientist for . . . about four hundred years, now that I think of it. But they just, sort of, gave up after Newton. The old geocentric, Aristotelian universe of the past was gone, even if they did keep it on the books a while longer. Yet, busy with the beginnings of the Protestant / Catholic wars that would end, again, about four hundred years later with the last blows being struck on the streets of Belfast, the priests and vicars had their hands full with one another. Thus, the real impact of the Newtonian revolution would play out not in the great cathedrals of Europe, but in its royal courts. Just consider what a universal law of gravity would do to a land where the legal authority to govern was rooted in the Divine Right of Kings. In Newton’s day (b. 1643 — d. 1727) Europe was awash in monarchs. You couldn’t swing a dead peasant without hitting one. Divine Right argued that God Himself chose who would rule and who would serve. Royalty lived in a luxury befitting those touched by the hands of The Almighty. The other side of that coin was the understanding that those who were born in filth and labor would die in filth and labor. To question that structure was to question the wisdom of God. By God’s own rules, as described by Newton’s math and observations, gravity affects all objects in the universe equally, and man, before he is anything else, is an object. Now imagine that a poor man is walking down the street with his hands in his pockets, searching for a few pennies with which to buy a meal. Being downcast, he does not see the pothole in the road. He steps into it and begins to fall. What will happen to that man? Will he be spared the hard landing and the broken nose, or will gravity, God’s rule, take him hard to the ground annnnnnnd, splat! Half a second later he is writhing in pain, trying to stop the bleeding from his nose while rubbing his twisted ankle at the same time. Now imagine that the king of the land is walking down a path through his apple orchard, hands in his pockets, fiddling with the crown jewels. He is lost in high and lofty thought, which blinds him to the pothole left behind by some thoughtless (and soon to be pilloried) gardener. Into the hole the king steps. What will become of him? Under the previous understanding of God’s rules for kings, one might suspect that the angels would be immediately repurposed from the surrounding apple trees and his eminence would have been spared the indignity of the broken nose and the sore ankle. But that is not what happens. If the king trips, the king falls. That is not by accident. That is God’s law. In a Newtonian universe, the Divine Right of Kings is an entirely evident scam, set up by men, not the all-seeing master of the cosmos. The proof that it was so perceived comes the following generation when individuals were sparked to revolution by the understanding that it is “Self-evident that all men are created equal.” Think about that line. It is utterly remarkable. The equality of man is self-evident in 1776, when only two generations before, the inequality of man was so self-evident that it had been the foundational truth of 1,000 years of European history. The American version of that revolution was successful, to a point, as it was in Haiti and throughout Latin America. In the land of Voltaire and Montesquieu, the revolution ate itself. The Jacobin tragedy aside, note that their preferred cutlery was chosen by design. Cutting off a man’s head is an easy enough thing to do. For hundreds of years the old guard had done so in a way to honor their root philosophical beliefs. Peasants got the dull axe; Nobles were afforded the mercy of the glistening saber. But in the French Revolution, both King and crank went out the exact same way: the guillotine, a perfect, if horrible and bloody, homage to the intellectual father of late Eighteenth Century political revolutionaries: Sir Isaac Newton. With the guillotine, gravity was the executioner and God stood idly by as the streets ran red. Though that was a great darkness, so much of what grew out of Newton’s incisive reasoning was beautiful and logical. Isaac Newton’s realizations began in the bounded world of numbers and physical science. But discoveries and empirical observations always lead to changes in realms seemingly far removed from the equations. In time, those ideas spread across the globe. There is no stopping them. Democracies (the good ones and the ones that are more pretense that practice) owe their existence in a very direct way to Isaac Newton’s epiphany underneath that apple tree. Did he know at the time how profound an impact this realization was going to have? Likely not. But we can see from our vantage just what a role it played. I believe that a similar process is in motion now, and that it started in 1968. On that Christmas Eve — at the end of a terrible year that began with the Tet Offensive in Vietnam, saw the assassinations of both MLK and RFK, witnesed the Chicago police turn on students during the Democratic National Convention, somehow survived the murder of so many beautiful Mexican students leading up to the Olympic Games while fires burned in the streets of Paris and far, far beyond as the establishment struggled to get a handle on some kids who really thought they had the power to speed up the arrival of a brighter day — three astronauts snapped a photograph that showed where all that tragedy took place, and yet from their vantage, it all looked so peaceful, so hopeful. Later that day, as the crew was speaking to “all of you on the Good Earth,” according to Commander Frank Borman, they signed off by reading the first ten verses of the Book of Genesis. Is it more remarkable that they chose such a poetic way to close that momentous day at the end of that tumultuous year, or that now, only forty-eight years later, the choice of Scripture seems oddly exclusive to our broader understanding of the world and its people? Why not a Native American poem? Why not something from the Māori? The Torah? The Koran? For a solid thousand years, the three great monotheistic religions have been knocking the stuffing out of one another, and that stuffing bleeds a terrible, clotted red. They do it because each Abrahamic sect has its loonies who think that God chose them above their brothers, that God made the Holy Land for their people exclusively. But how in the hell, after seeing that image of the Earth above the horizon of the moon, can anyone other than the willfully blind believe that one small sliver of land to the east of a minor sea is more holy than the rest of the planet? How can anyone believe that the Jordan River is more holy than the Mississippi or the Ganges? How can anyone believe in a chosen people? It’s nuts. And now we have turned our cameras outward and seen a universe of 300 billion galaxies made up, each one, of hundreds of billions of stars. No serious thinker can believe that God is rooting for one sect on this minor planet to exterminate everyone for His love. Such a God is unworthy of the name. It is self-evident now, even if it was not just two generations ago. For a beautiful visual on the Apollo VIII astronauts taking the Earthrise picture, check this out. Click here to pick up the latest issue of La Cuadra for your mobile phone or e-reader! One used to be able to hear and discuss these things in Social Studies 3, at a particular high school in Brooklyn. I think the out of the box teacher there, took to writing for a magazine and inspiring lucky drunks and other good folk in Central America. Love you Brother!